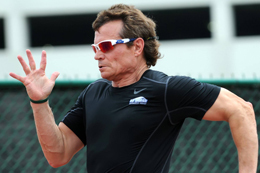 Birthdate: May 15, 1957, Pottsville, Pa.
Events: 100, 200, 400 Meters and relays. Career Highlight: Craig Davis played running back in high school and participated in T&F starting with a four team track program in the 5th grade. Hamstring issues hindered a 3 year top seeded HS sprinter from ever reaching the state finals. After his college career, he took the next 25 years before rediscovering his passion for the rubberized track surface at the 2005 Florida Sunshine State Games. From 2005-2011, he earned many Gold/Silver/Bronze medals in both the Florida State Games, Florida Senior Games, Georgia State Games, etc. In 2008, Craig sustained a herniated L5-S1 disk which sidelined and almost ended his progression back to the track but in 2011 he had a break out year with his best times be recorded. At 5’6” and shrinking, his CFO suggested that he make a website www.ShortestFastestOldestWhiteGuyIKnow.com which contains additional information and helpful health/fitness tips. 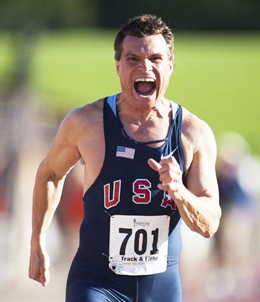 Recent Performances: In the 2011 World Master’s Outdoor T&F Championship in Sacramento, California, he made the 50-54 age bracket Finals in both the 100m (7th place) and the 200m (6th place). At the Penn Relays he ran an amazing 2nd leg of the 4×100 relay which placed his team into 3rd place earning the team a Bronze Medal. In 2012, he was the lead leg for the Gold Medal Team for the 50+ 4×400 relay at the Millrose Games and at the Penn Relays he was the 100 Meter Silver Medalist behind teammate Alan Tissenbalum. In 2013, his first Indoor National efforts earned Bronze in both the 200m and 400m. The Latest: In April 2012 with many thanks to his daughter, Craig became a first time grandfather a little girl, Ava, and they say he’s too young for one of those granddaddy names so just call him “G” or “G-Pop”! Back to Back in April 2013 his son provided the grandson, Colt Allen, middle name after G-Pop.